Water continues to be a challenge for the 21st century with 2.5 billion people still lacking access to improved sanitation. Climate change, deteriorating water quality, water losses, population growth, and heightened competition between water users are putting increased pressure on water supply and demand. Water risk is not just an environmentalist issue, the WEF’s recent Global Risk 2013 report lists water supply crisis as the top five risks facing the world in terms of likelihood and potential impact on par with systematic financial crisis. Businesses are impacted by variability in water supply, floods, droughts, and water stress. In Brazil, an unusually arid and dry season has the country, which relies on hydropower for two thirds of its electricity, facing power rationing for the first time in a decade. This caused losses of US$26 billion to industry and negatively impacted economic growth. Floods during Hurricane Sandy are estimated to exceed insured losses of about US$7 billion. Risks arise not just from running out of water to operate, but from dry shipping lanes, power constraints, supply chain disruptions, floods, and regulation. Since August 2012, drought conditions have been threatening to shut down barge traffic on the Mississippi, which transports US$180 billion worth of cargo every year. In response to increasing impacts of water risk, WRI developed Aqueduct for users to assess geographic water risks globally. Aqueduct maps water risks, for 15,000 catchments (sub-basins) worldwide using a hydrological model that simulates the flow of water throughout the world’s river basins. Aqueduct also uses advanced techniques to disaggregate data spatially – for instance, using satellite images of earth at night to locate where industrial density, and therefore industrial water use, is highest. 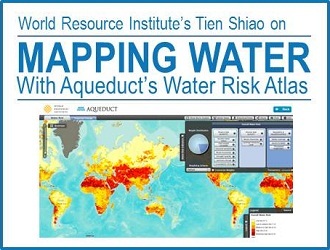 Aqueduct brings together data on twelve different indicators of water risk, and combines them to create comprehensive overall water risk maps of the world. Aqueduct’s water risk maps are unique because of their high resolution, comprehensiveness, and up-to-date information on water-related risks. The Aqueduct project was built in partnership with a vast team of independent expert reviewers and an alliance of leading companies and foundations, starting in 2010 with founding partners Goldman Sachs and GE. Since its inception three years ago, the Aqueduct Alliance of supporters has expanded to a total of fourteen companies, organizations, and governments including Shell, Skoll Global Threats Fund, Bloomberg, Dow, Talisman, DuPont, John Deere, Proctor and Gamble, United Technologies, Veolia Water, the Government of the Netherlands, and the Government of Sweden. The Alliance members recognize water as an issue of the future, and appreciate the opportunity to work with WRI and collaborate with other companies that are prioritizing water risk. There has been continued interest in Aqueduct’s water risk maps from many users, but especially companies and investors. Since Aqueduct’s official launch three weeks ago, the water risk maps have been downloaded by hundreds of corporations, consultancies, governments, researchers, and investors all over the world. Companies including Proctor and Gamble, McDonald’s, and Owens Corning, to name a few, are using Aqueduct to assess external water-related threats to their direct operations and supply chains in order to prioritize areas that require additional investment and response strategies. Aqueduct’s water risk maps can be coupled with other water management tools such as the Ceres Aqua Gauge or GEMI Local Water Tool to improve a company’s overall corporate water strategy. Climate change and increased water variability over time means regional water supply will become more uncertain giving rise to risk factors that are interlinked and complex to analyze. HSBC notes that it is important for investors to start incorporating an assessment of water factors into investment analysis because understanding where possible pinch point areas are at a sub-national level, is necessary in the face of greater uncertainty in water supply. A company’s water disclosure, including where the company’s operations are affected by water risk and how they are responding to those risks, is becoming more important. Investors will increasingly demand more disclosure on geographical exposure of operations as a means to factor in more robust analysis in the face of potential disruption in earnings from natural factors. Disclosure improves the ability of stakeholder audiences including investors to evaluate a company’s water practices, make comparisons across companies, and thus foster greater corporate accountability.2 Aqueduct’s water risk maps can be used to disclose multiple aspects of a company’s exposure to water risk. In addition to water stress, Aqueduct can provide information on water supply variability, floods, droughts, storage capacity to buffer variability, inadequate water treatment reflecting ongoing water quality concerns, groundwater stress, population with insufficient access to safe drinking water, ecosystem vulnerability, and media awareness. This year, WRI will continue to improve Aqueduct by adding indicators to capture the complexity of water-related regulatory uncertainty. WRI will also update our projected change in water stress maps to look at how water stress could change as a result of demographic shift, economic growth, and climate change. Finally, WRI will explore ways to simplify reporting of Aqueduct’s water risk results to disclosure initiatives. Aqueduct’s water risk maps and onlinen tool could not be made possible without our partners – the hydrological modelers iSciences and the online tool developers Blue Raster. 2 CEO Water Mandate, Corporate Water Disclosure: Toward a Common Approach to Reporting Water Issues. Tien Shiao joined the Pacific Institute in 2016. She is a Senior Research Associate for the Corporate Sustainability team and has ten years of experience in corporate sustainability, stakeholder engagement, and water risk and stewardship. Tien’s work focuses on innovative solutions for corporate water challenges, encompassing corporate disclosure frameworks and impact metrics. Tien received a B.S. in Civil and Environmental Engineering from the University of Michigan – Ann Arbor and a Master’s degree in Environmental Management from the Yale School of Forestry and Environmental Studies. She is fluent in English and Mandarin.